After completely failing to relax last issue as we prepped for the Auto Expo we decided that enough was enough and took a break for this issue. So yes, there is the enormous Auto Expo 2018 report - that's what we were saving energy for, remember? The 2018 Auto Expo has motorcycles like the Hero XPulse 200 as well as the concept motorcycles like the TVS Zeppelin. Similarly, the cars ranged from the ready to launch all-new Honda Amaze and Toyota Yaris to the concepts, like the Kia SP and Maruti's Future S.
In the days before the Expo, we also handed out the 2018 CNBC-TV18 OVERDRIVE Awards, the 18th edition of the top automotive recognition in our industry. The class of 2017 is in the issue! And then to recover, we took a break. Abhay went to Morocco and Thailand to ride the smashing new Triumph Tiger 800 and the cheeky Yamaha MT-09. Shumi rode the new TVS Ntorq 125 scooter and that's after he returned from Valencia having ridden the impressive new Ducati Panigale V4. Harley got Rishabh rebuild an engine I disassembled! Rohit kicked back in the luxurious Lexus LS500h and then was whisked off to West Asia to taste the new Porsche Cayenne. And after all that rest we did a little bit of work. Vaishali's eye-opening Dakar report, a story detailing the history of the three generations of the Maruti Suzuki Swift and the road test of the phenomenal TVS Apache RR 310. These were our serious work stories and we made light work of these, naturally. But that's not all. It never is, right? 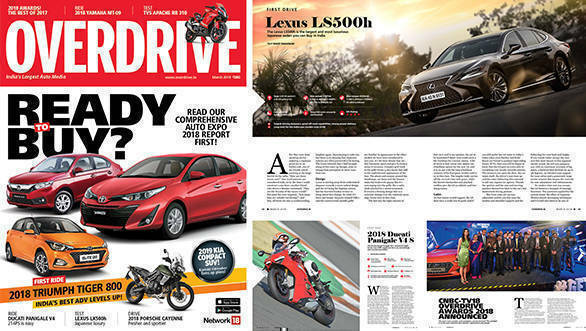 The March issue of OVERDRIVE is a blockbuster! We've never chilled out so hard, promise. Get a copy right now. First, because you cannot afford to miss it. And second, because this kind of relaxation produces really great stories!